What do mermaids, pelicans, cowboys, owls, azaleas, and pirates have in common? Well?? If you’re stumped, we don’t blame you. 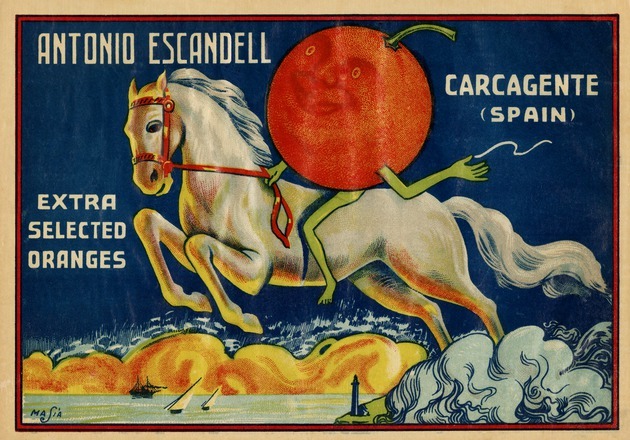 The answer is that all of these things were once depicted on citrus crate labels attached to boxes of fresh Florida oranges. If you’ve ever worked in a commercial kitchen, you may have seen some of the art that is “descended” from the tradition of produce crate labels. Large boxes of carrots, cabbage, and the like still sometimes feature branded mascots or fancy fonts meant to distinguish a company brand. But these leftovers really aren’t much like the elaborate and beautiful citrus crate labels that collectors now cherish. Let’s take a look back at the history of a practical idea that eventually became folk art and an important part of Florida’s agricultural history. Florida, of course, started growing oranges (and other citrus) hundreds of years ago, back in the 1600s. By the 1700s, we were shipping fruit to other colonies, and the industry only grew from there. However, it was hard for growers to “brand” their fruit such that buyers could know one grove or seller from another. Naturally, they wanted a way to help buyers remember their particular oranges, grapefruit, or tangerines. California growers were actually the ones to come up with the idea of placing brightly colored paper labels on the wooden crates used to pack and ship fruit and vegetables. But Florida orange growers quickly caught on. These labels bore the names and logos of the growers, and soon became an obvious way for growers to distinguish themselves through a memorable image. The labels also served a practical function, with the background color denoting the grade of the fruit inside. Blue stood for grade A, red was grade B, and yellow or green was mixed grade. This system flourished from the 1870s up to about the second world war, when the wood and metal used to make the packing crates became too valuable to use for fruit shipping and the industry switched over to printed cardboard. Though a few packers held on, by the late ‘50s, citrus crate labels had disappeared. Today, we recognize that these labels represent a key part of Florida’s history, both because of our long history of growing oranges and other citrus and because of their unique artistic value. 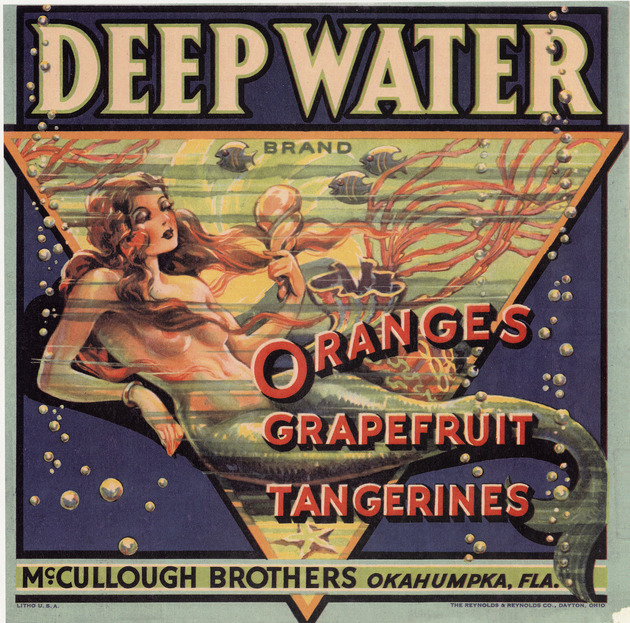 The University of Florida recently acquired over 3000 citrus crate labels from a private collector, Jerry Chiccone. 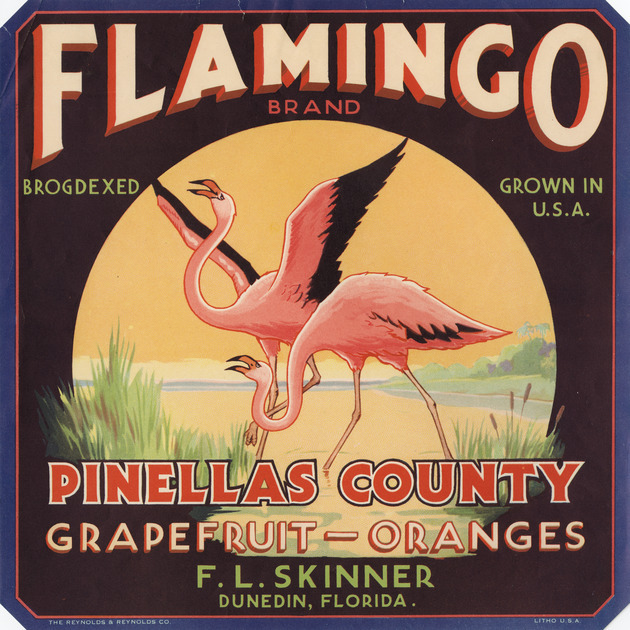 Digital versions of the labels can be searched and viewed online at the Jerry Chiccone Jr. Florida Citrus Label Collection. Love the look of these labels? Want to enjoy gazing up at the glory of fresh, ripe Florida oranges, tangerine, and grapefruit depicted in art, every day, all year round? (We happen to understand.) You can easily find prints quite inexpensively--$15 and up. If you want the originals, it all depends on the type, subject, and condition. I found some on the web for as little as $5-15, though they can get up to $50 or more. Still, they’re an easily affordable collectible. Enjoy these fun artifacts from Florida’s citrus history. Amazing artwork. Keep it up. Wow. This is amazing. Keep up sharing such amazing artwork. If you also have your art surrounded by gaudy or inappropriately colored mats, you've lowered your chances of an award even further. It's best to be conservative. Use white or off-white mats. Nice. Keep up your great work. i have read your blog, this is a very helpful blog thanks for sharing your guidelines. Thank you for sharing superb information. and this is very interesting and informative. Great work! Thanks for sharing. Thank you for posting this blog. your information is really helpful.